I don’t know anything about rhinos! I’ve seen them at the zoo, and I know they live in Africa. That’s about it. Oh, and I know they have horns. I know that people take elephants’ tusks for the ivory, but I didn’t realize that rhinos’ horns are also in demand. Who knew that rhino horns could be sawed off and regrown? Interesting, right? I hate to admit that I learned a lot about rhinos from this fictional story! It’s quite the story too! 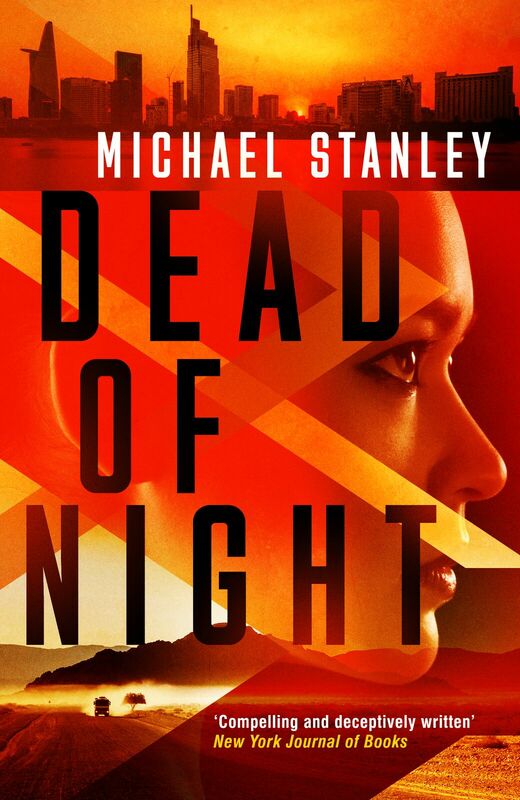 I hope you enjoy my book review of Dead of Night by Michael Stanley. “When freelance journalist, Crystal Nguyen, heads to South Africa, she thinks she’ll be researching an article on rhino-horn smuggling for National Geographic, while searching for her missing colleague. But, within a week, she’s been hunting poachers, hunted by their bosses, and then arrested in connection with a murder. And everyone is after a briefcase full of money that may hold the key to everything. Wow! What a ride! I got sucked into this book from the very beginning! Crys is one tough chick! And she’s brave…or stupid. I’m still not sure which. When she doesn’t hear back from her hopefully-more-than-friend Michael, she starts to worry. She calls into National Geographic and they haven’t heard anything either. So she goes to Africa to finish the story and to hopefully find Michael. She should have stayed home. Going to Africa proves difficult, and puts her in a lot of danger. She has some amazing adventures, and then she has some terrifying experiences. Crys is a great character. She’s written and developed well, she’s relatable, and mostly realistic. Crys tends to act and then think, which proves detrimental in many instances, and it made me cringe. I like that she’s a strong female character. She’s smart and tough. When she gets to Africa many other characters are introduced. They are also well written and well developed. Most of them have a hint of uncertainty about them; you’re constantly wondering if they’re the good guys or the bad guys. Sometimes they may even be a bit of both! I liked that, though. It adds a hint of mystery and tension that keeps you reading. Just be prepared—the bad guys are scary! One of the things I liked most about this book was learning about the situation with the rhinos. I’d never really thought about rhino horns being sold on the black market. And I had NO idea that you could saw a rhino horn off and it would grow back! I learned a lot! I don’t know how much is true and how much is fiction, but it did shed some light on the topic for me. It’s sad how integrity is lacking in some people. They’ll do almost anything just for the dollars attached. This book is fast-paced and action-packed. Crys gets herself into several sticky situations, and somehow she always ends up where the trouble is. I liked the writing style a lot; I enjoyed the descriptions of the African landscape, and thought the dialogues were realistic and unforced. The thing I didn’t like in the book were the torture scenes. There was one scene that was brutally graphic. It was disgusting, and reading it made me sick to my stomach. I skipped some of it because it was way too graphic and detailed for my taste. There was at least one other torture scene, but it wasn’t quite as bad. I couldn’t put this book down! It may or may not have been the wee hours of the morning when I finished this book. One.More.Chapter. I’m not sure if we’ll see more of Crys, but I hope we do! And as a side note, the authors are male. Many male authors do not write good female characters. I didn’t feel that way in this book; I thought they did a good job.